Enjoyable Me: I'll Take You Down to Chinatown! I'll Take You Down to Chinatown! My younger brother Kelly made a brief stop in San Francisco on his way to China for a summer internship, although he was born in California he hasn't been back here since he was little. It was a nice opportunity to spend some quality time with him and show him the city before he headed into foreign lands. I showed him around Fisherman's Wharf, the Embarcadero, and Chinatown. I know you are probably thinking, why the heck would you take your brother to Chinatown when he is about to be in China in a few days?? Because I'm silly and Chinatown is fun for random shopping which I love to do. I came away with a few goodies which were very exciting (probably only to me)! These colorful Chinese porcelain soup spoons are scaled down versions of the originals and just too cute to pass up! I have been on a mini utensil kick lately, every time I am at a restaurant and they have those tiny spoons or forks I wish that they would magically jump into my purse, but they never do. One adorable little fork from the NANP conference might have made its way home with me. 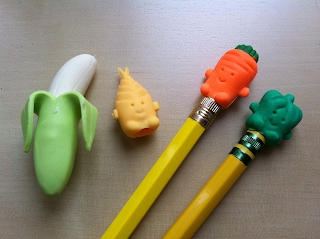 I fell in love with these super cute veggie pencil toppers, if I could blog in pencil I would just so I could use these! The banana is obvious and so is the carrot but the next two veggies are a bit ambiguous looking, any suggestions on what they might be?? We didn't end up eating in Chinatown, it took a lot of willpower on my end to pass up all of the bizarre treats and bowls of noodles, I love noodles!!! Instead I had planned on taking Kelly to this little hole in the wall called Cordon Bleu Vietnamese Restaurant. This place has been around for ages and our mom use to go there when she was my age and living in San Francisco. The menu is small but the food is good and cheap, the ultimate combination. The owner Katie will grill up five-spice chicken and ladle up a thick meat sauce to drown your mound of rice, I think Kelly was in heaven. This place is really tiny with just a few seats at the counter and 2 small tables in the back; I recommend avoiding the lunch crowd or placing an order to go if you are in a hurry. Over the weekend Wren and I hit up the California Academy of Sciences, we had been wanting to go for a while now but it's pretty pricey at $29.95 for adults plus an additional $5 surcharge during their listed Peak Periods!! Luckily I had marked off this past weekend on our calendar to go because it was part of their Neighborhood Free Days Program. They have a ton of exhibits to check out including the rainforest, planetarium, aquarium and so much more! I love how this one turtle is just chilling on top of the mound of spinach while the others try to eat. Right as we were about to leave I saw this cool little exhibit called Carbon Cafe that talked about how the foods we eat impact the earth and the significance of organic farming. Go Cal Academy! The academy is located in the middle of Golden Gate Park so I recommend packing a picnic and enjoying the park afterward. We are still newbies to San Francisco so if anyone has suggestions on other places to check out I'd love to hear them.